I didn't observe it having a humbucker in the bridge position. Rather, the Deluxe series is known for its Lace Sensor pickups. The Lace Sensor pickup family has a unique radiant field barrier system that surrounds both the coil and the magnets, eliminating the annoying 60-cycle hum so common to single coil pickups. Glen was using the bridge position pickup in all of his solos at the Sioux Falls concert because the Plus Deluxe has a hot-output Red Lace Sensor pickup in that position which gives a fat punchy humbucker-like sound cutting right through the mix. Specwise, the Plus Deluxe series is known for its Schaller locking tuners, Wilkinson roller nut and the aforementioned Lace Sensor SSS pickups (neck position: Blue / middle position: Silver or Gold / bridge position: Red). Glen's Plus Deluxe is a stock model in Blue Pearl Burst (Dust) (color code: 90) with a high gloss all-polyester finish which was slightly modified after the fact. Instead of the standard three control knobs (for volume, tone, and tone, respectively), Glen had the knobs reduced to a total of two (master volume and master tone only) so that his picking hand could easily rest on the bridge while picking without the regular Strat volume control knob getting in the way of his playing. My guess would be that's it's the backing band of the righteous brothers. Glen toured with them as part of the backing band. The man on the right seems to be Jerry Cole, fellow ex-Champs and studio guitarist. Thanks for the information Cowpoke!! Fantastic read! Does anyone know who Glen was playing with in the picture from 1964? Glen was playing a White Standard Fender Stratocaster as early as 1987. In fact, that was his main 6 string electric guitar while I was in the band from 1987 to 1991. As his Guitar Tech for that period of time I kept that guitar and his Ovation Bluebird 12 String at my home when we weren't on the road. Here's a clip from a show we did in Doncaster England in 1990. It plainly shows the Strat and the Guitar Jeff Dayton mentioned that he owned at the time. The Fender Stratocaster (Strat) was designed by Leo Fender in the mid 50's. It has been used in all genre's of music and copied by many knock off companies. Glen's tenure with a strat has been limited, but it is evident that he liked that design and feel in an electric guitar in his later years. Here is an early picture of Glen using a strat around 1964. It is interesting to note that Forrest White documented in his book, "Fender, The Inside Story", that around the summer of 1963 Glen expressed, to him, an interest in being a "demonstrator" of Fender guitars. Forrest was impressed with Glen's playing and credentials, but Don Randall shot it down saying "No, do not. These guys around a dime a dozen," Forrest summed up the mistake by stating "I think that since Glen has earned a lot of money, demonstrating the capabilities of the equipment of our competitors"
In the late 80's/ early 90's, Glen returned to performing with a Strat. Jeff Dayton shares that "Glen loved my '84 Vintage '57 (reissue) Strat, with EMGs, I had when I met him. You will see that Strat in a few early videos, I was part of, starting in 1987. Glen wanted one and we couldn't find another 57 reissue, so he ordered one from Westwood Music. 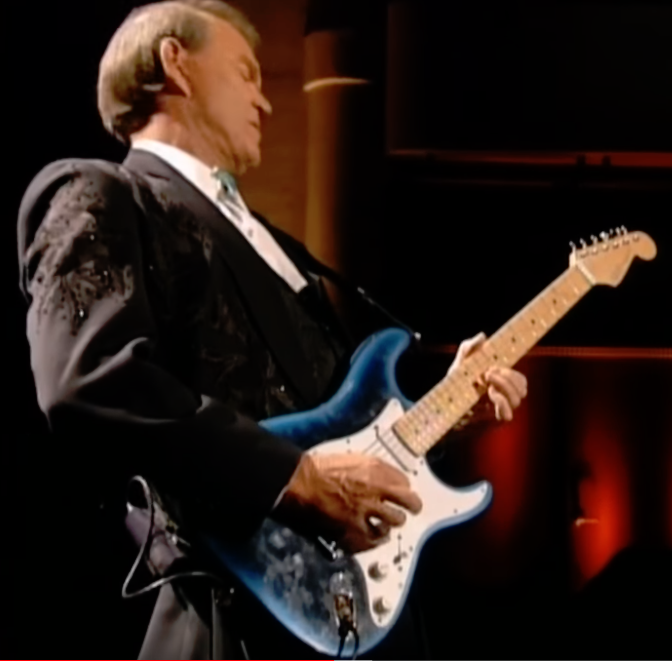 They built him a blonde Mary Kay finish rosewood board hard tail, which ended up later as my white baritone I used on Galveston, Wichita Lineman and House of Love. Don't know where it is now." Jeff added "Steve Warner, in about 1991, gave Glen a white bodied, with a maple neck American Standard Strat. "He used it a lot and loved it, but he gave it to me for a while, maybe a year, then asked for it back." I am not sure if Jeff meant that Glen asked for it back, or Steve. Jeff went on to say that "From the white 91 on, he never went back to rosewood fingerboards that I know of." 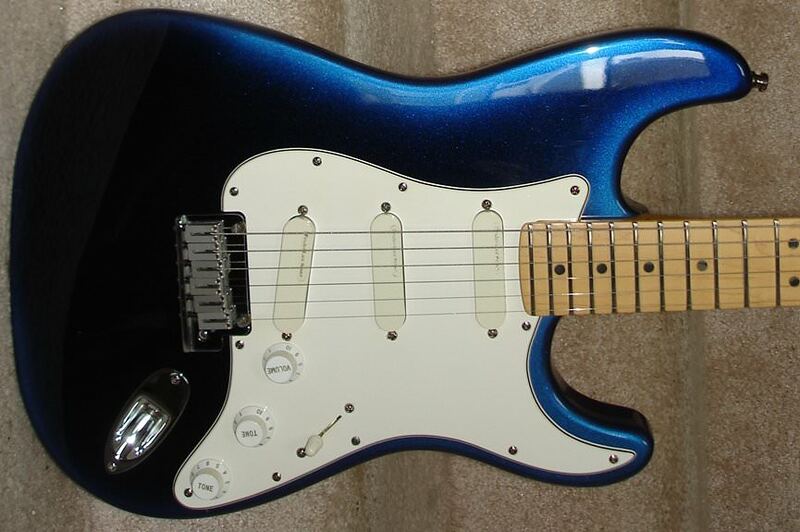 The beautiful blue burst Strat you see Glen with, in the early 90's, is described as a Strat Plus Deluxe that had some modifications, noticeably a double humbucker in the bridge position, a roller nut and a maple fret board. Sometime, after the turn of the century, Glen went to a G&L customized Comanche. 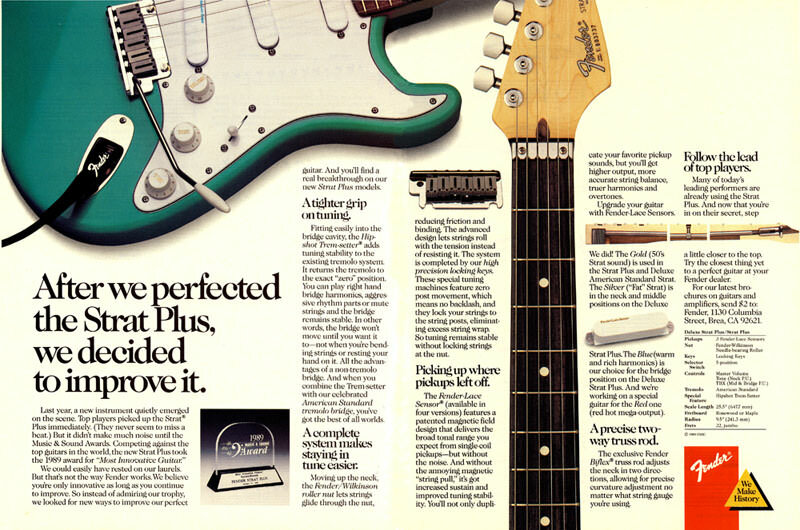 It certainly is a Strat knockoff, but was (re)designed by Leo Fender. Glen obviously preferred it to the Strat, as he finished out his career with it. Glens fondness for his blue Stratocaster is shown in the "stairs" picture. He has it on the bottom row, his far left. Additionally, there is a red one further up the staircase.